Platform : Nintendo 3DS LL. Condition : Used (Good,Console Only). Platform: Nintendo 3ds LL/XL. Condition : Used (Good,Console Only). Platform : Nintendo 3DS LL. Condition : Used (Good,All accessories are included). Platform : Nintendo 3DS LL. Condition : New. New Nintendo 3DS LL body software of "Super Smash Bros. for Nintendo 3DS" is not included. Edition Does not apply. All my products are 100% Authentic ! Language is only Japanese. International Warranty does not apply to this product. We correspond to it responsibly. Platform: Nintendo 3ds LL/XL. Language Japanese. This item is 100% authentic, Japanese goods. To use this product, you must have the AC adapter for charging. Platform: Nintendo 3DS. Version: Japanese. Usa,Canada,Australia USD20. EMS Asia USD15. Platform: Nintendo 3ds LL/XL. Condition : New. :Non-Japanese console/software is NOT available with Japanese 3DS due to Region Lock. Warranty period is complied with manufacuture regulation. Condition : NEW. We would appreciate your understanding. Platform : Nintendo 3ds LL/XL. Language Japanese. This product is 100% authentic. To use this product, you must have the AC adapter for charging. Middle East. 3DS LL console! So you can play only Japanese ver. To use this product, you must have the AC adapter for charging. PlatformNintendo 3DS LL/XL. Region CodeNTSC-J (Japan). 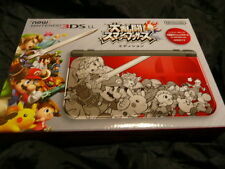 Nintendo 3DS LL Console Super Smash Brothers Edition MarioBros. Version: Japanese. To use this product, you must have the AC adapter for charging. Platform: Nintendo 3DS. International Warranty does not apply to this product. We correspond to it responsibly. Version: Japanese. It takes 2 weeks to 4 weeks. Condition：USED. NEW Nintendo 3DS LL XL Console Pokemon Solgaleo Lunala Black Japan ver. So you can play only Japanese ver. I'm a Japanese man living in Tokyo. Condition : New. 5 out of 5 stars - NEW Nintendo 3DS LL XL Console Pokemon Solgaleo Lunala Black Japan ver. 1 product rating1 product ratings - NEW Nintendo 3DS LL XL Console Pokemon Solgaleo Lunala Black Japan ver. Asia : ＄Free. Usa,Canada,Australia : ＄Free. We hope you enjoy! Condition:USED(Very Good!). We try our best to send it to you! It is our pleasure to provide high-quality Japanese products to the world. 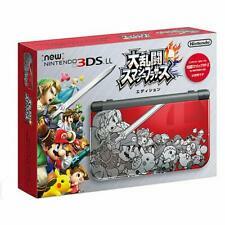 It is the New Nintendo 3DS LL body which designed the characters appearing in Super Smash Bros. Smash Brothers. "Super Smash Bros. Smash Brothers for Nintendo 3DS" software is not included. Model : New Nintendo 3DS LL. : Smash Bros. edition. Middle East. I will provide courteous and responsive service. This item is New Nintendo 3DS LL Pokemon Sorugareo Runaara Black Limited Ver. It is the New Nintendo 3DS LL of special specifications. Model number: RED-S-KCAA. Weight: 800 g.
From Japan. We hope you enjoy! Condition:USED(Very Good!). We try our best to send it to you! It is our pleasure to provide high-quality Japanese products to the world. Type：Nintendo 3DS LL. Color：Black. Condition : NEW. Version: Japanese. To use this product, you must have the AC adapter for charging. PlatformNintendo 3DS LL/XL. to your local country. HardwarePlatform : Nintendo 3DS. Platform : Nintendo 3DS. made in japan. Language is only Japanese(can't change to English). We hope you enjoy! Condition: New. Condition : NEW. To use this product, you must have the AC adapter for charging. 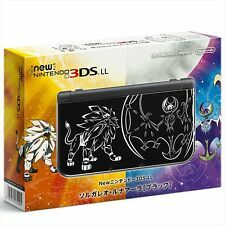 3DS LL XL Console Pokemon Solgaleo Lunala Black Japan ver. RED-S-KCAA Nintendo. Edition:Solgaleo Lunala. Platform:Nintendo 3DS. This item is Japan import. Middle East. 2 - 4 weeks. "New Nintendo 3DS / 3DS LL" has an area where NFC can read and write on the bottom screen, so you can enjoy "amiibo" planned for release in the future and its corresponding software. New Nintendo 3DS LL appeared on the black body, the legendary Pokemon appeared in "Pocket Monster Sun Moon" was designed! Platform : Nintendo 3DS LL. 100% Authentic! Region Code : NTSC-J (Japan). Country/Region of Manufacture : Japan.